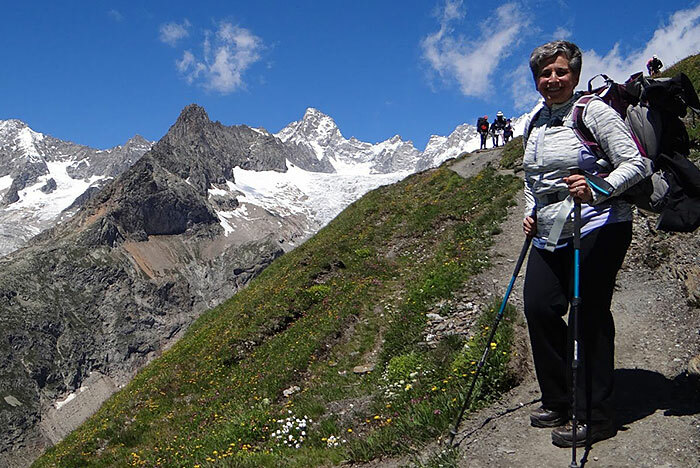 Everything you need to know in order to plan your bespoke Tour du Mont Blanc, Western Europe’s highest mountain at 4,810 metres. The oldest recording of a journey around Mont Blanc, (White Mountain) goes to Horace Benedict de Saussure, a Swiss Geologist, who undertook the journey in 1767 (aged 27). Since then each of the surrounding peaks have attracted climbers and the journey around the mountain has attracted those seeking adventure, solitude, or both!The tour offers you the chance to visit France, Switzerland and Italy. The cultural and physical differences in each of these countries becomes immediately obvious as you enter them, the past physical barrier meant that for much of each year it was impossible to travel from one area to the other. Now, between June and September each year, when the snow recedes to around 3,000 metres altitude, the passes open up and the journey may be completed in warm temperatures and fairly settled weather conditions. Please note the guided walks are aimed at families and groups only. Sorry but we don’t cater for individuals. The itinerary below is based on a 12 day clockwise tour starting and finishing in Chamonix, France, 3 nights in huts and 9 hotel nights.. Arrive at Chamonix and check into the Hotel Richmonde. Meet your guide, who will run through the itinerary in more detail and answer any questions you may have. We finish with a short stroll into town for dinner. Leaving Chamonix, we take the cable car up to Plan Praz at 2000 metres We start the grand tour with a climb of just under 500 metres towards the Aiguille de la Charlanon before turning towards Lac Blanc for lunch. The ‘White Lake’, is the prime spot from which to view the Mont Blanc massif from the French side. After lunch there are opportunities to spot Ibex as we descend into Argentiere. Distance of 12 kilometres, ascent 800m/descent 1100m. Leaving our hotel, we walk through the old village of Argentiere and up to Montroc. Then a steady climb through the Pine forest rewards us with a view of Le Tour, and the Le Tour glacier. 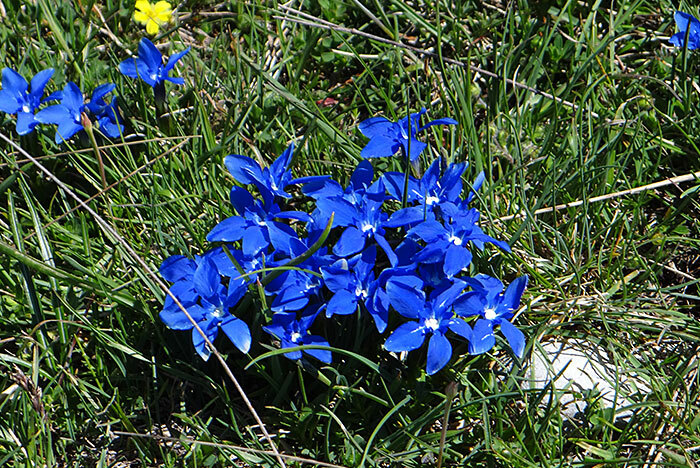 After a coffee break in one of the ‘Alpage’s’ we continue up to the Col du Balme refuge, the border with Switzerland. After lunch, spent gazing down the length of the Chamonix valley, we continue up for about 30 minutes to the Tete de Balme 2,321m. Beyond, our descent begins through Alpine pastures, inhabited by grazing cattle, giving way to the pine forests before arriving in Trient. A final short climb brings us to the Col du Forclaz and our hotel. Distance 9 Kilometres and 1200 metres ascent/1100m descent. The Bovine Route (800 metre ascent, 6 hrs) with a lunch stop at the ‘Alpage’, is the easier option. Alternatively, if the weather is suitable and the group are feeling strong, there is the Finetre d’Arpette (1200m, 8 hrs) with its glacial views. Either route ends at the Hotel Splendide in Champex Lac. An easier day with an initial drop through forests to the valley floor. Our afternoon is spent on an easy incline following the valley up through a series of farming villages, over a long extinct terminal moraine and narrow paths above the river to arrive in the small resort of La Fouly. We then lodge overnight in a hotel. This morning we climb to the Grand Col Ferret, the border of Switzerland & Italy. We are now crossing into the western flank of the Mont Blanc massif. A chance to see the glaciers close up and some of the impressive rock formations that make up the Grande Jourasse. There are huts to stop at throughout the journey for refreshments. Our first hut stay is in the Rifugio Bonatti, named after the famous Italian climber and explorer Walter Bonatti. Distance 14 kilometres and 1200m up/1000m decent, 7.5 hrs. We follow the traditional TMB route up into a rock amphitheatre before climbing to the Col Sapin. This place is very special to me, the one place on the TMB where you will find the ‘Stella Alpina’ (Eidelweiss) growing in it’s natural environment on the rocky mountainside. We descend through forests, passing donkeys, goats and sheep before arriving in Courmayeur for a 2 night stay. 12km, 800m ascent/1400m descent. 6.5 hrs. We take a ride on the cable car up to the glacier, visit the spa at Pre st Didier. Then another cable car up to an outdoor swimming pool for a sun bathe and swim or just walk along the old pedestrianised high street of Courmayeur for coffee and ‘Gelato’. In the evening we’ll stroll over to Dolonne and have dinner in one of the restaurants in this quiet mountain village. Climbing above the Val Veny offers fantastic close up views of Mont Blanc and the glaciere Miage below. We drop into the Val Veny high up and after a stop at the Rifugio Elizabetta we continue our climb to arrive at the Col du Seine, the border of Italy and France. An hour and a half descent brings us to the Refuge Mottets and our overnight stay. 14 kilometres, 1500m climb/1200m decent. 8 hrs. 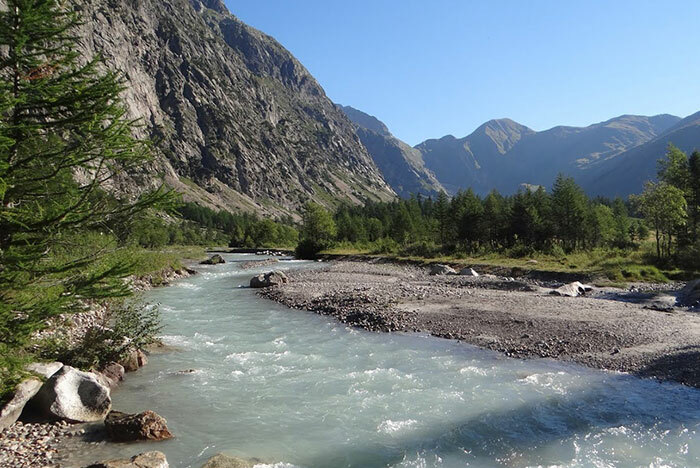 We follow the glacial waters along the valley for half an hour before beginning a steady climb to the Col du Fours. You should be lucky and see Ibex on this relatively quiet section. From the Col, our joint highest point on the circuit, we are only 25 minutes from the Refuge Bonhomme and lunch! After lunch we contour around the mountain for an hour before starting our descent into the valley below to arrive at the Refuge Nant Borant (home of ‘Oggy’). Please note you’ll have to book a trek if you want to know more! 15km, 900m ascent/1000m descent. 8 hrs..
Today we have a steady climb that will once again bring us to the Plan Praz Cable car, via Brevent, and some stunning views of the Bossons Glacier as well as the Aiguille du Midi, Mont Maudit, Mont Blanc du Tacal and Mont Blanc. A great place to picnic! After lunch we continue over Brevent and down to Plan Praz. 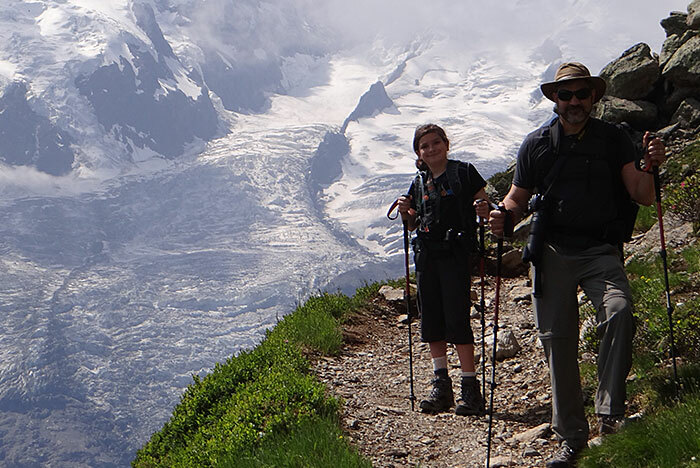 Use the return portion of your ticket to descend into Chamonix and return to the Hotel Richmonde for the final night. 12km, 1300m ascent/500m descent. 7 hrs. 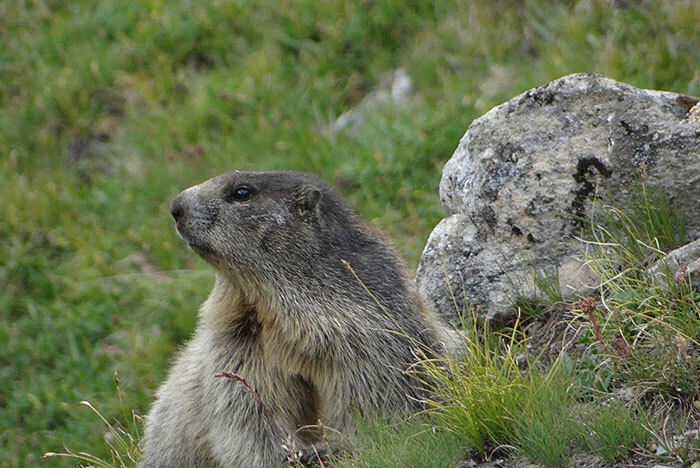 We have reached the end of your Tour du Mont Blanc guided walk. We say our goodbyes and head home. Assistance with arranging in-country transfers to/from airports or rail terminals. Lunches each day – picnics can be purchased at huts, usually costing 9-15 euro. Transfer from end of trip. Information on how to arrive at Chamonix or Courmayeur from any airport/rail station will be included in your welcome instructions on receipt of booking. These walks run any time from June-September available during any day of the week. If you are traveling as a couple or family of 4, 6 or 8 there are limited private rooms available in some huts. Please ask prior to booking if you would prefer this option (subject to availability and additional costs of around 10-15 euro per person per night). Start in Chamonix, France or Courmayeur, Italy? Go clockwise or anti clockwise? Full circuit or half circuit? Hotels, huts or a combination?